Equine Science is a dynamic career choice that is attracting more and more women to seek a degree in this exciting field. At Judson College, we have developed our Equine Science program with that interest in mind. Our program is designed to both challenge a student academically and to provide her with the practical experience to achieve her goals, whatever they may be. As Alabama’s first college to offer a Bachelor’s degree in Equine Science, Judson has a strong record of excellence in academic training for careers in the equine industry. In our program, you will meet and work with professionals in the equine industry via shadowing experiences and directed internships. Much like the equine industry itself, our program is multi-faceted, allowing a student to either pursue a Bachelor of Arts or a Bachelor of Science degree in Equine Science. Majoring in Equine Science will give you the necessary training in career areas as diverse as barn management, professional riding, equine journalism, and therapeutic riding instruction and training.. Our students can also tailor their degree to their interests with a variety of interdisciplinary academic program offerings. The field of Equine Facilitated Mental Health is an increasingly popular method of therapy aimed at meeting physical, cognitive and emotional needs of a host of patients. 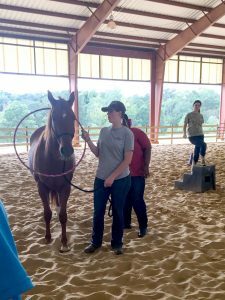 Students at Judson can pursue an education in this growing field by combining Equine Science coursework with a major in Psychology to prepare for a career in this dynamic area. Our Equine Science faculty includes two professors who are certified by the Professional Association of Therapeutic Horsemanship (PATH). Our students also gain valuable experience through internships and volunteer opportunities with therapeutic riding facilities such as Montgomery Area Non-Traditional Equestrians (MANE) and Therapeutic Riding of Tuscaloosa (TROT), among others. For students who feel their future endeavors include managing an equine facility or business, our program teams up with the Business department to provide the appropriate curriculum for equine business management. Equine Science students can minor in Business to gain the necessary knowledge in the areas of management, marketing, finance and accounting to run a successful business. This knowledge is the perfect complement to the Equine Science curriculum for students who one day want to run their own equine-related business. For our students whose dream is to attend graduate school in Equine Science, our program offers a wonderful foundation of equine-related knowledge and skills upon which to build future successes. Finally, Equine Science students may wish to join a tradition of successful students in our Pre-Veterinary program, which offers all prerequisite courses for admission to veterinary school, in addition to invaluable hands-on experience with horses. These students can combine an Equine Science major with a strong background in traditional science courses, which make them highly competitive for acceptance into vet school. Judson offers experienced riders the opportunity to join our varsity Intercollegiate Horse Show Association (IHSA) team, which competes in both hunt seat and Western riding styles. Judson students in various other degree programs take riding classes as electives. Some students choose to bring a favorite horse to campus with them to board at our outstanding on-campus facilities. Boarding spaces are limited, so inquire early about our boarding program! Whether you’re most interested in riding competitively, engaging in community service, or preparing for a career or graduate school, we’ll help you find ways to combine your love of horses with both a meaningful college experience and a solid academic preparation for your future.